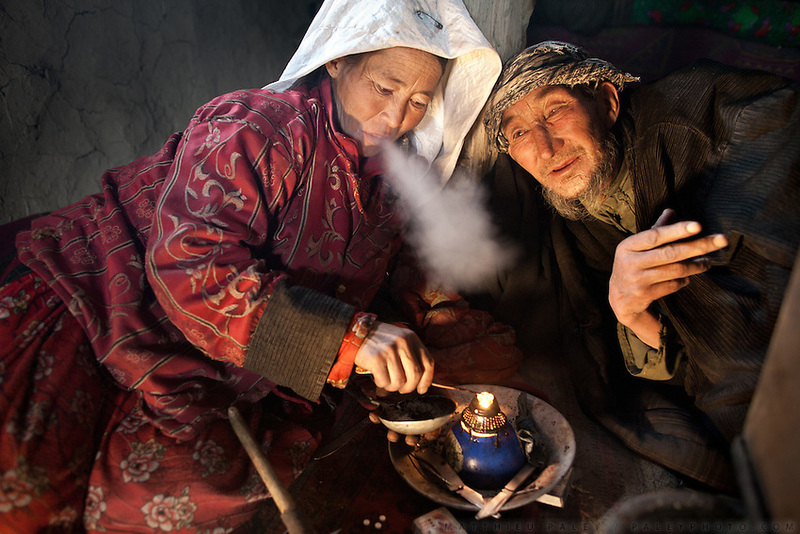 Khaltcha and Abdul Muttalib smoke opium several times a day - like approximately 20% of the Kyrgyz. ?We started smoking when we lost our first child? says Abdul, ?Every year, one of our children would die? - often from diseases easily treatable elsewhere. Only one, a son, survived to age five. Then he, too, passed away. ?We lost 11 children, we are unlucky?. In the Pamir, it is not unusual for parents to lose six or seven children. Most Kyrgyz are extremely unsentimental about death and dying and accept it as an unavoidable part of life. In 2007, Alex Duncan, a British doctor, collected data in the Afghan Pamir and established that child-under-five mortality there was 520 deaths per 1,000 live births (52% mortality), the world's highest rate. Main reasons to this are the intense isolation, the high altitude environment and no access to doctors or health clinics...The Kyrgyz settlement of Tchelab, near Chaqmaqtin lake, Haji Bootoo Boi's camp...Trekking through the high altitude plateau of the Little Pamir mountains, where the Afghan Kyrgyz community live all year, on the borders of China, Tajikistan and Pakistan.